How many times do we think that being “one” is so insignificant? 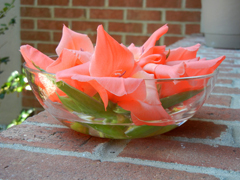 Check out this “bowl” of my absolute favorite Gladiola’s – they are the smallest of the Glads we have, but they make a collective statement. What might not be understood is that these blooms were the ones that had to be removed in order to make the stems long enough to peak over the top of the vase they were placed into. But in the bowl, each one was “just” right and each one contributed to the look – like a team. Separated, they were not enough to stand out, but together they formed a warm, vibrant, significant presence – as if they were held in the palm of a large hand. Guess Who’s Hand we are held in as Christians? As we find ourselves anchored in the Word (the water), we have the ability to be a reflection of God’s Grace to the world around us! Rounding out a whopping 137 total stems taken from our front raised flower bed, the Gladiolas have been sensational. While the Daylilies are doing well, they are not quite as share-able as the Glads. 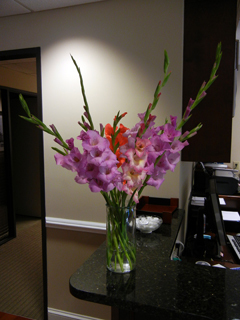 This is a bouquet we took to the office today for a meeting spruce up. There are eleven (11) in this grouping. Wonderful opportunity to enjoy some of the hard work we put into the flower beds. 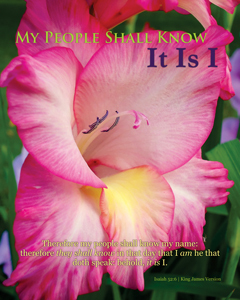 Was SO hoping we would have a couple of the yellow ones to go with the purple, then we’d had ECU colors going… Isn’t it wonderful that we KNOW who has arranged us – God the Father Himself! Since He made us, He has no problem keeping the flowers in order! Are we determined to understand that the word “shall” is the word “determined”? The definition of words is fixing to go full circle on us – it also can mean “should”, as in “I should have…” What we do, say, listen to, walk away from affects the “shall” and the “that must be God’s child” view others see in, of, about us. Are we “determined” that others WILL see the Lord in us? Do we view each situation we find ourselves, first indicating to them this is how we “should” let the Lord take control of me? Will we tell others so they will hear Him speak? Do you hear Him now? 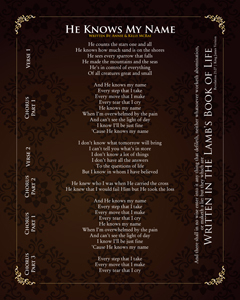 Oh how we NEED to understand “He Knows My Name”! Sometimes we need a “child” to show us what “faith” is supposed to be and how to LIVE it. A little fella at Lancaster Baptist Church in Lancaster California did just that – playing and singing a heartfelt song twice before a group of thousands – yes, that number is thousands. The incredible ease in which he did so captivated each person with himbeing eleven (11) years old was both fascinating and humbling – for he sang as if His Lord was sitting right there beside him. 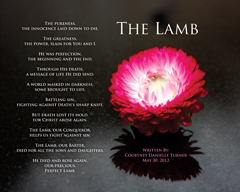 Travis was NOT the inspiration, the presence of the Holy Spirit that poured from him is what inspired each of us! Bro. Tim Jr. and I conversed via text about it and we both recorded it – the second time Travis played/sang, my sound system nearly went to FULL power on my computer and I reached for my DROID to record it. It affected Bro. Tim, Pastor and I in the same manner – no matter that I was 2300 miles away watching on LiveStream and they were sitting right there. The only difference detected in the second time Travis played/sang is that it was STRONGER. My questions to each of us are these: would anyone and I do mean ANYONE want you or I to “do” what is being done in their presence over again so they could fully understand HOW the Holy Spirit is working through us? Would anyone reach for the volume, turn it up to full power as it were, so they would not miss any moment of the Holy Spirit speaking through us? Would ANYONE want to make sure that someone all the way across the country (USA) or half way around the their world would be encouraged because they were able to see/hear/experience the same thing they were even though they were not in their physical presence? Last question: Would ANYONE care?